A comfort food without the high caloric price tag. This is a soup recipe that has been requested by friends, and is so good that I crave it. So I share it with you. Wonderful even during the summer, it also is fantastic comfort food when sick or on a cold day. You can tweak this dish with lite coconut milk, lime zest instead of lemongrass, or if you have access to Thai ingredients use kaffir lime and Thai basil. Lemongrass is easy to grow and to use. Just the base of the peeled stalk is used as a flavoring. 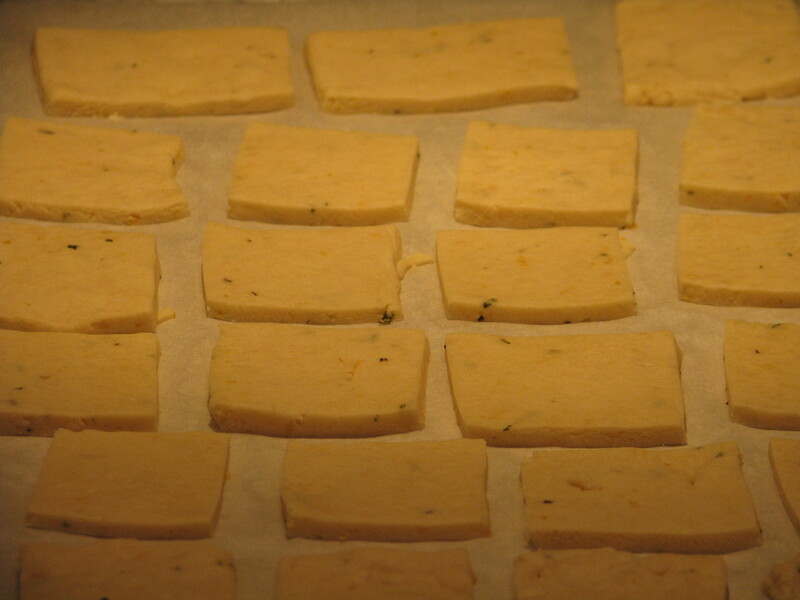 Cut it only in half so the pieces are easily found in the soup and put aside. I’ve had it without tofu, and without mushrooms, and it is still wonderful. Put the lime in the coconut, and drink it all up! Don’t put too many extra veggies in it; it is a simple soup. A simple, delicious vegetarian Tom Kha soup. 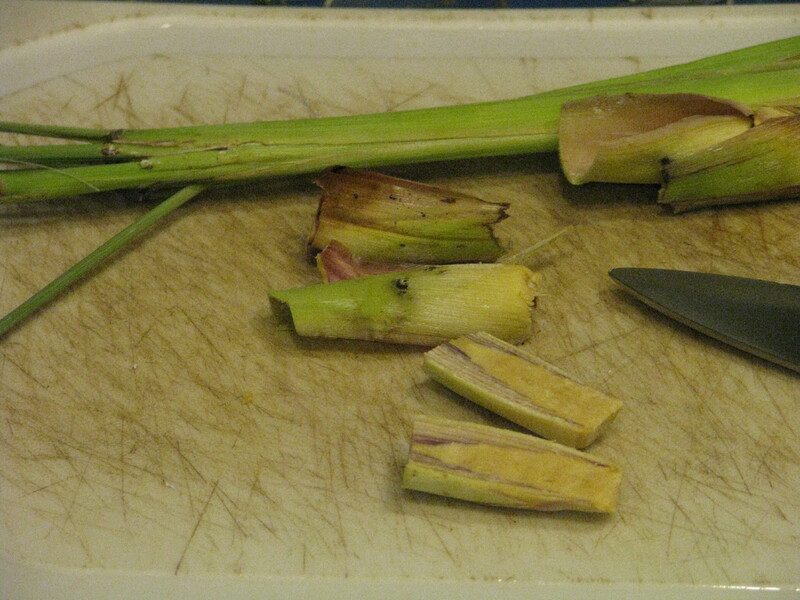 The lemongrass isn't meant to be eaten because its too tough. The kaffir lime leaf may be eaten only if you use a young one and slice very thinly before adding it. Combine lemongrass, ginger, kaffir leaf, Thai basil leaves, and coconut milk with broth in a large saucepan and bring to a boil. Reduce heat to medium-low and simmer for 5 – 10 minutes. Add the curry paste a half-teaspoon at a time, stirring well and tasting for desired hotness. Stir in the tofu, mushrooms, sugar, and soy sauce. Simmer for about 10 minutes more. Taste before adding additional optional salt. Serve as is or over hot rice. Offer fresh lime to squeeze on top as desired (it makes the flavors pop). 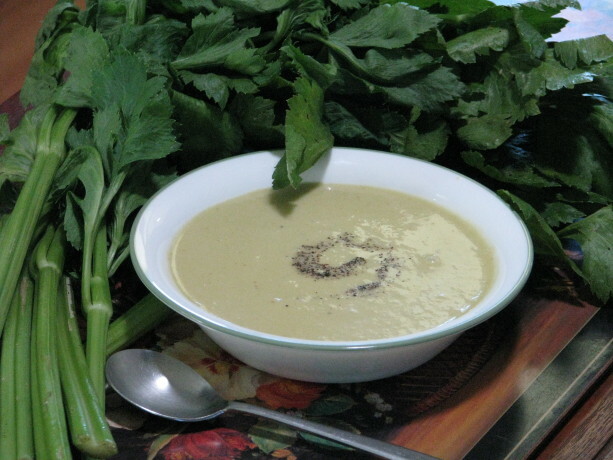 Celery soup, served hot or cold, is delicious and great for you! I thought I had posted this wonderful soup but apparently I hadn’t. Celery is a remarkable food for helping combat mental aging, among other attributes. This year we grew our own celery which is strong, fiberous and slightly bitter. We use it diced in stir-fry and many dishes including Celery Soup. This soup can be served hot or chilled, and you can either use cream at the end to finish it or just rely on the included potato for the thickener. Add a little cayenne to spice it up and increase its medicinal value. This is a blended soup that doesn’t freeze well (the flavor changes), so eat it all up! This is a lovely light green soup… great for Halloween! 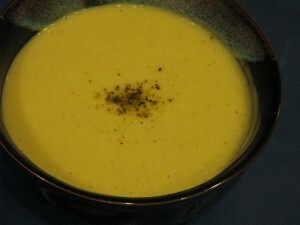 For another green soup, try my Zucchini and Rosemary Soup, too. This easy, delicious low-fat soup can be served hot or chilled, or dressed up with cream. Add celery, shallots or leeks, potato, celery seed and cayenne (if using), and a pinch of salt. Partially cover and cook, stirring occasionall,y until vegetables are soft but not browned, about 15 minutes. Reduce heat to low, cover and cook 30 minutes. Allow to cool enough to be comfortable for you to puree in blender or food processor, in batches until completely smooth. 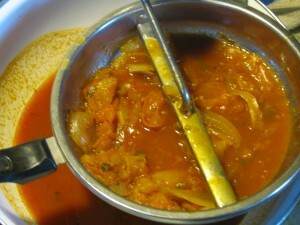 If necessary pour through a fine sieve into a large bowl, pressing with a spoon to extract as much liquid as possible. If you have a Vitamix, just blend it on high and don't sieve. 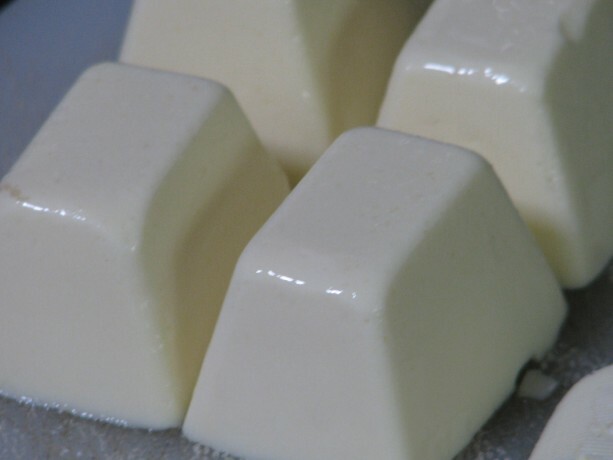 Stir in cream (if using) and serve, garnished with celery leaves or croutons. The other night I had the February blahs. I was hungry, felt as if I was fighting a cold, worn out from laboring in the garden, and wanted comfort food. I had very little in the vegetable tray, but what I had was perfect for this soup. I made it that night, and I refined it tonight. This is a healthy, low-calorie, vegan soup that is pureed smooth and silky. Two factors make this soup special. 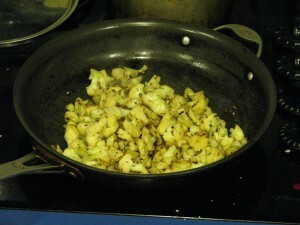 First, you almost char the cauliflower and caraway in a very hot pan until it is dark brown. I’ll call it deeply browning, because I don’t want that burnt flavor of charring. I was once served a tomato soup at the Four Season’s Resort which obviously used charred tomatoes, and it tasted so burned that I couldn’t eat it. In fact, it nauseated me, like when you really burn something on the stove and that smell is all over the house. I don’t think that that was the response they were looking for! Deeply browning the cauliflower brings out a wonderful rounded flavor (you can deeply brown the cauliflower, add a little broth and steam for a few minutes, and serve it this way as a side dish… delicious!). The caraway releases its flavor in the heat, and then becomes a very subtle note in the soup so that you really can’t distinguish it. If you would like a heavier caraway flavor, just increase the amount of seeds. 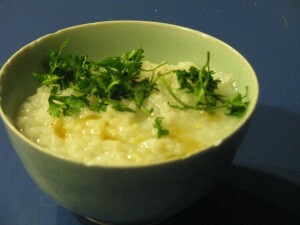 The soup is pureed and is naturally creamy with the addition of the potatoes. While the frying pan is cooling you use it to toast the salt and cayenne, again releasing and deepening the flavors. Use this as a topping, which is then stirred into the soup by the guest. This soup doesn’t take long to make and is perfect for a cool winter’s evening, and doesn’t make the house smell like cauliflower, either. Sprinkle heated spices on top, then have guests stir in. A creamy, low-fat vegan vegetable soup that is fast, easy and very satisfying. In a heat-tolerant frying pan, add two tablespoons olive oil and heat on high until almost smoking. Add cauliflower bits (watch for splashing! ), caraway seeds and stir. 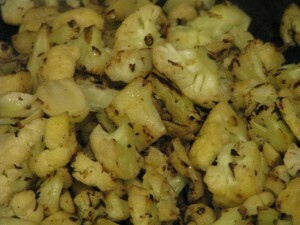 Allow cauliflower to cook between stirring so that it develops dark brown marks on it. It should smell savory but not burned. Meanwhile, heat other two tablespoons of olive oil in a medium saucepan. Stir in shallots, celery, potato and wine. Cook until wine is reduced to very little. Add cauliflower and caraway to saucepan. Don't wash the frying pan yet. Add broth and one can of water to saucepan. Cover and bring to a boil, then reduce to simmer for 30 minutes. In the cooling frying pan, stir together the cayenne pepper and salt and let it darken without burning. Keep in reserve. When soup is done, blend it until it is smooth, and caraway is as fine as your blender or VitaMix can make it. Pour back into saucepan and check for seasoning. With a spoon (not your fingers... cayenne gets everywhere!) sprinkle some of the cayenne and salt mixture onto the soup. Either swirl it decoratively, or have guests stir it in before eating. This recipe I copied from a newspaper when I was a teenager, and embellished on over the years. The dollop of whipped cream on top always appealed to me. It makes a very satisfying tomato soup. It is a good way to use an abundance of tomatoes. The key to the great flavor is to use low-acid tomatoes, and fresh basil and thyme. Of course, you can substitute canned tomatoes and dried herbs as well; if you do that, you can just blend up the cooked soup at the end. 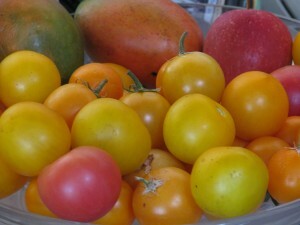 I have a lot of yellow tomatoes, which are not high-acid. I had an idea of making a golden tomato soup, but the tomato paste in the recipe turned the soup red, of course. I entertained ideas about making a tomato paste from yellow tomatoes, but I’m not sure I’m that ambitious. There are two ways of making this soup from fresh tomatoes, both of which incur a little extra effort. The first is to blanch then peel the tomatoes, and squeeze out the seeds. Then after the soup is cooked you can just puree the soup in a blender. This makes a little thicker soup. The other way is to quarter the whole tomatoes and cook, then at the end turn the soup through a food mill, and strain out the seeds. This soup is a little thinner. You don’t want to blend up the seeds and peel or the soup will be bitter. Both ways make a fresh, tasty soup that can be served hot or cold, and is great with cheesy croutons or sandwiches. The dollop of whipped cream can become a drizzle, or be eliminated. 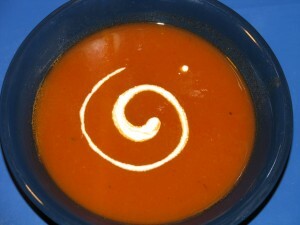 If you’d rather have a cream of tomato soup, then add more milk or cream to the soup and gently heat (but not boil) and then serve. Below is the recipe for the food mill method. A garden-fresh tomato soup that sings of summer. This soup should accompany a sandwich, salad, or be the first course of a larger dinner. 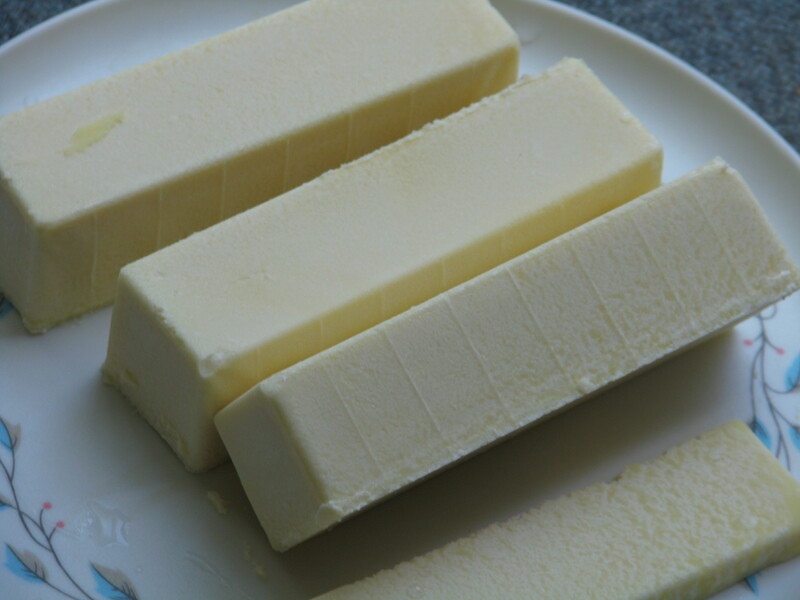 In a large saucepan, combine butter and oil and heat until butter melts. 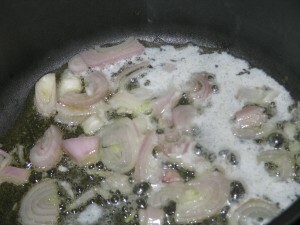 Add onion; cook until tender but not brown. Stir in tomatoes, paste, basil, thyme, sugar and alcohol (if using). When boiling, reduce heat, cover and simmer 40 minutes. Stir in salt and pepper (to taste). Reheat and serve with a dollop or drizzle of cream and a sprinkling of herbs on top. Carrots are a gardening miracle. From such a minuscule seed, out pops a root strong enough to plow through tough soil and soak up minerals. 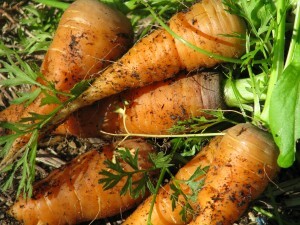 The carrots shoot those minerals up to the ferny leaves, and when they die, leave the minerals to enhance the topsoil. 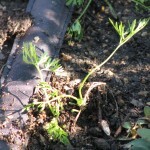 Carrots fill the roll as one of nature’s miner plants. They are also terrific to eat and very good for you. I’m sure you’ve heard about how high in beta-carotene carrots are, and how they help eyesight. If you haven’t there are hundreds of Internet references to look up. Carrots are a very versatile vegetable, tasty raw as well as cooked. There are many carrot varieties. Nantes, Chantenay, Danvers… these are the common varieties you’ll see sold in most seed stores. 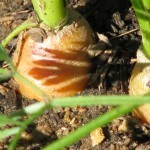 However there are white carrots, purple carrots, deep red carrots, and carrots of many sizes and shapes. Some are woody, some very sweet, some tender and some strongly flavored. 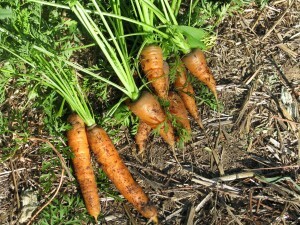 If you grow your own organic carrots, feel around the roots to see if they are large enough to pull. Don’t leave them in the ground for too long or they’ll become less sweet and woody in texture. 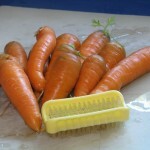 Also, if you use your own organically grown carrots, you don’t need to peel them. Just use a brush to scrub off the dirt. Carrots are wonderful to eat when simply steamed until tender, then buttered or drizzled with olive oil and chopped herbs. Dill is particularly good, as are chives. I’ve found many carrot recipes, but most of them are sweet not savory. Honey-glazed carrots, carrot soup with curry and sweet coconut milk, brown sugar carrots… I don’t care for them. Carrots are naturally sweet, and to slop more sweet stuff on top is overdoing it. Sweetened carrots belong in carrot cake, and there is only one recipe for it that I find not cloying and heavy (I’ll share that recipe with you another time). I also like carrots in a savory soup. Here is an unusual recipe that is tasty, easy, low in calories, and has protein from an unusual source: vegetarian sausage patties. 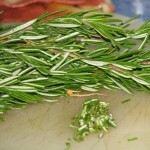 Celery adds dimension to the flavor as does minced fresh rosemary. 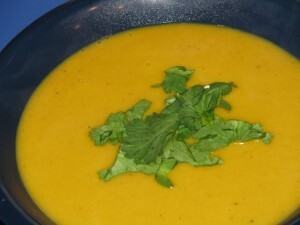 This golden, low-fat soup brings out the savory goodness of carrots. In medium saucepan, heat olive oil over medium-high heat. Add shallot and cook for two minutes. Add celery and stir occasionally for about three minutes. Move the vegetables to one side and add two vegetarian sausage patties. Flip when cooked on one side. Add potato, carrots and rosemary. Stir, breaking up sausage patties with spatula. Bring to boil then lower temperature to a simmer and partially cover with the pot lid. Cook for about twenty minutes, until carrots are just tender. Cool, then blend soup until smooth. Return soup to pot and reheat. Serve hot, topped with cilantro leaves if used. Serve this golden orange soup in bowls that compliment it’s color. 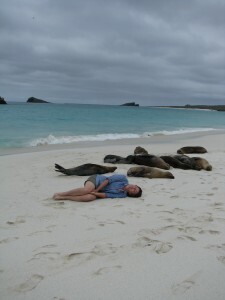 A couple of years ago my daughter and I went on a birdwatching ecotour of the cloud forests in Ecuador, and then to the Galapagos islands. The flights ended and began in Quito, the capital city, which holds about 75% of the entire population of Ecuador. Eating wasn’t as much a challenge as we had anticipated; often in lower economic areas there are better non-meat choices. We stayed at a hotel in Quito at the beginning, middle and end of our journey. Room service was the same price as eating in the restaurant, so we indulged in our room for most meals because we were exhausted. One of the three separate nights we stayed there we watched Lord of the Rings in Spanish. Neither of us really speaks Spanish, but I understand enough to get the gist of what is being said. On our last day the streets were blocked off because the president of Ecuador came to stay in the adjacent hotel and we saw his party board a plane as ours was taking off the next day. The hotel menu offered interesting side dishes made with interesting ingredients such as yucca and plantain. Our absolute favorite, though, was Locro de Papas. Literally this translates as Potato Stew, but it wasn’t a stew. 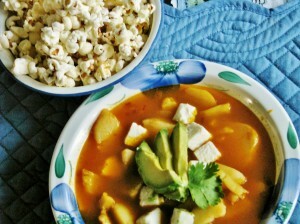 Locro de Papas is one of the most popular dishes in Ecuador and the Andes. It is wholesome peasant food that has as many variations as Americans have chili recipes. At home I managed to reproduce the version that we fell in love with as best as I could. A few ingredients make the soup special. 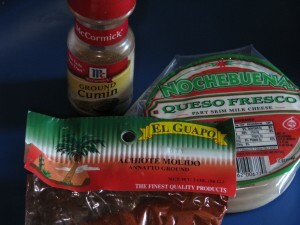 One ingredient which you may not have on your pantry shelves, but is easily obtained in the Mexican food isle, is annatto, also called ground anchiote. It has a slight flavor and is used to color foods. It is not essential for the success of this soup, but it is a nice addition. They use an oil that is colored with the anchiote seeds, but using the ground spice with olive oil works just fine. What is essential is ground cumin. Some people can’t stand the smell of cumin, which is slightly reminiscent of dirty socks. However the flavor carries this soup perfectly. Another addition is sliced avocado. Warm avocado is melt-in-your-mouth delicious. Living in Fallbrook, the Avocado Capital of the United States, I have ready access to the many forms avocados can take. Avocado fudge, ice cream and fried avocado slices are all standards of the yearly Avocado Festival. Another addition to this soup which creates a wonderful texture as well as adding protein and calcium, is cubed non-melty cheese. If you are non-dairy, then substitute with cubed firm tofu (which can be added even with the cheese). The textures of the potatoes, cheese and avocado are heavenly. 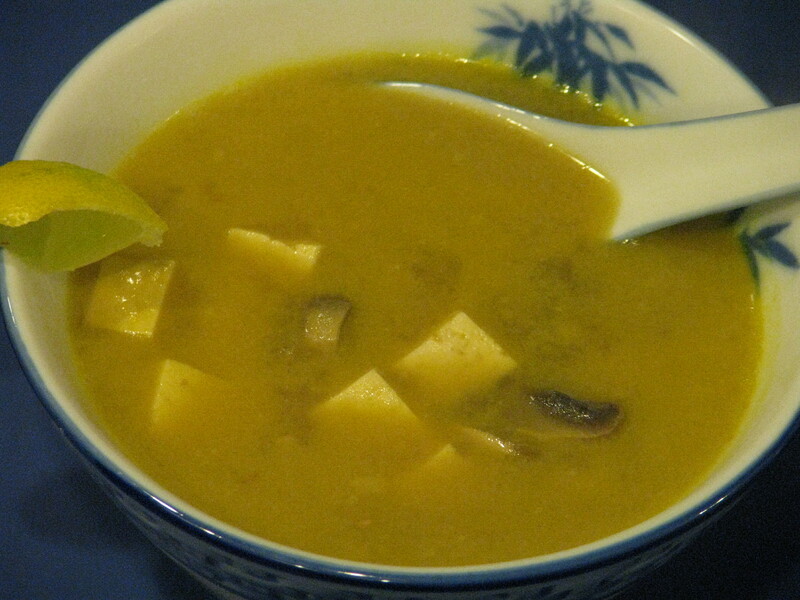 One of the standards of an Ecuadorian lunch or dinner is an introductory soup, usually vegetarian. We ate some fantastic soups. Instead of bread on one occasion, we were given a bowl of popcorn to sprinkle on our soup. It was great! I’ve included it here. Be sure to slice the potatoes no less than 1/4 inch thick; if any thinner they will fall apart when cooking. The version in the hotel had lots of butter in it; I’ve replaced half of it with olive oil, but if you don’t do butter then use all olive oil. The butter’s fat content makes the soup satisfying to the palate. This is a quick and easy soup. Don’t cheat yourself out of a great meal by not making Locro de Papas! This version of the favorite soup of South America is quick to make and very filling. In a medium saucepan, heat olive oil and butter over medium-high heat. Add diced shallots and cook until translucent, about three minutes. 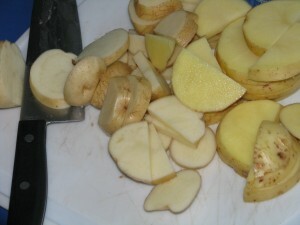 Cut potato slices in half and add to pot. Stir in cumin and annatto. Bring soup to a simmer and cook, uncovered, for about twenty minutes, until potatoes are just tender enough to part when pressed. Don't overcook! Ladle soup into wide shallow soup bowls. 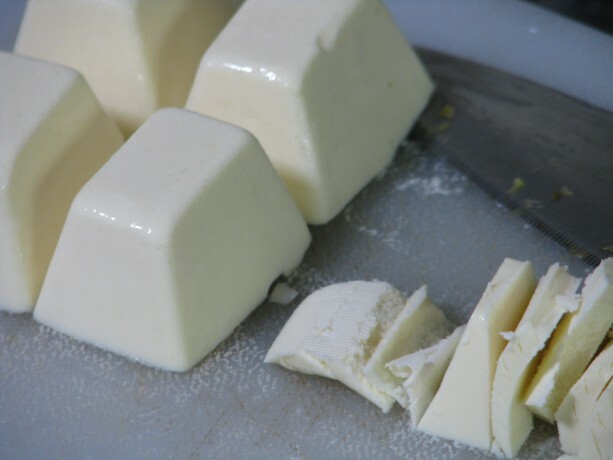 Add chunks of cheese and tofu (if using). Garnish with cilantro leaves and serve immediately. Provide bowls of popcorn alongside soup to add as topping (don't add it ahead of time, they become soggy instantly).